With Spring Training just around the corner we are so happy to finally show off the first gameplay trailer for MLB The Show 19. Did you catch all the new feature teases and legends showcased throughout the video? Don’t sweat it if you didn’t — we’ll give them all a proper reveal soon. One of the activities the development looks forward to every year are the Twitch livestreams. It’s a great opportunity for us to show our faithful fans what we’ve been working on to makes this year’s game the best ever. This year we have seven pre-launch streams packed with content running the gamut of our feature set. These include two brand new modes “March To October” and “Moments”. 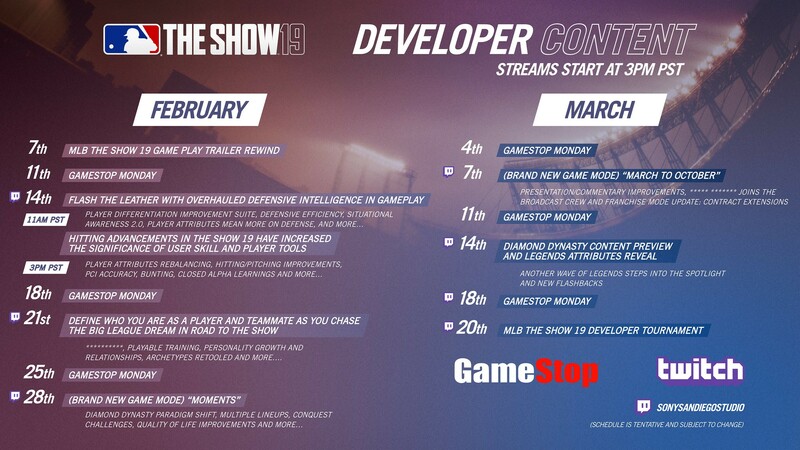 Don’t forget, MLB The Show 19 launches on March 26, 2019. The Standard Edition is $59.99 USD (MSRP)/$79.99 CAD (MSRP). For those of you curious as to what Editions we have available and what this year’s pre-order items are, you can check ’em out here. This is an especially exciting year for us here at PlayStation. We’re thrilled to welcome a new class of Legends to the team, including some all-time greats, and even more excited to show you what else we have in store in MLB The Show 19! In the meantime, please make sure to check The Show Nation, our Twitter, Facebook, and Instagram accounts between now and March 26 for the latest updates.